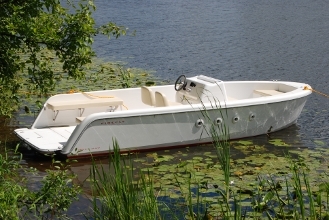 Firefly is a multipurpose motor boat – can be used for fun of cruising, trips, fishing or diving. She is also suitable for professional use, like various on the water jobs, fishing, transport of people and cargo. Firefly hull is designed as a displacement-type one. This way of cruising is very energy and cost efficient - the Firefly with one liter of fuel cruises distance five times longer than similar size planing-type motor boats. Unique underwater hull shape ensures great stability and protects the propeller and rudder against damage caused by underwater obstacles. Moreover, the boat has very small draught – only 20 to 30 cm. Thanks to it, Firefly is a perfect choice for shallow river cruising. She can also easily get close to the shore, by front or stern, without risk of propeller damage. Firefly’s cockpit is exceptionally spacious. The boat is equipped with permanent seats for four persons and three retractable seats for additional eight persons. This solution gives unique possibility to flexibly configure cockpit layout according to current needs. Big forepeak and separate anchor chamber are situated at the bow. The luggage may be carried also in two spacious storages below cockpit’s floor and in one handy locker in central console. On its top there is a convenient place to lay down bits and bobs, like mobile phone or sunglasses. Two tables can be installed in the cockpit. The rear wall of the cockpit is movable. When closed, the rear ramp door of the Firefly enhances safety of people and goods onboard. When hauled down the rear ramp enlarges cockpit’s area and creates comfy platform, very useful for swimming and jumping into water. Rear cockpit wall is equipped with a small gate, which makes boarding easier, when the rear ramp is in closed position. It also improves access to swimming ladder, stored in a cassette in a stern. Composite roof protects the people on board against sun and rain. Under the roof lighting system for entire cockpit and a life buoy and luggage compartment can be installed beneath it. At the top of roof navigation lights, siren, antennas, spot light and other gear can be installed. The roof middle part can be equipped optionally with tinted anti-sun glass or solar batteries. Firefly is offered in 2 propulsion versions - powered by inboard electric motor or diesel engine. Electric propulsion, despite obvious advantages like silent running, lack of exhaust gases and precise maneuvering at low speed, is an exceptionally economical solution. Electricity cost for all day cruising is about 1,2 EUR. Additionally, electric drive is very durable and maintenance-free, what generates a lot of savings because there is no oil, filters and spark plugs which have to be periodically exchanged in combustion engines. There is possibility to install solar cells on the roof top, which recharge batteries for next cruise. Inboard diesel engine consumes only 1-2 liters of fuel per hour. Thanks to it, costs are relatively low and range with one fuel tank (70 l) is large. The Firefly has been designed by means of advanced computer methods. In the boat manufacturing process the most modern solutions are used – advanced materials and computerized numerical control (CNC) machine tools. It all resulted in an unique design developed precisely in every detail.